Hey. Have you been noticing the new blog design? Seems like last year I was playing around and completely screwed up my template so this is only the third and possible last version you’ll see in a while. Along with the new template, I’m writing more. Heck yeah! It’s not a resolution but I just have a lot to say and share. And this looser style of writing is so fast that I can churn something out like this in 10 minutes. Between the new template and more writing, I’ve been focusing on more mindful eating and taking care of myself from the inside out. Late last year, my body felt like it was shutting down both physically and emotionally. And with everything going on, I was warned that on a physical level, I had to take care of myself. So I sought out to nourish myself with whole grains, lots of greens and nutrient-rich proteins. Spinach salads and baked salmon could only take me so far and I needed something that could be refrigerated for a few days and reheated. 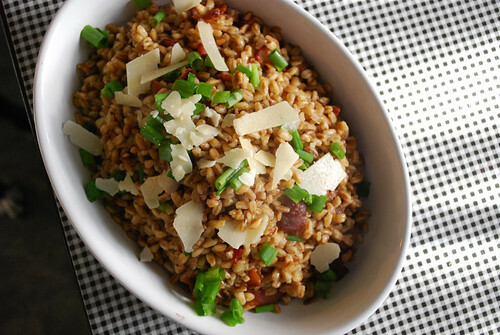 And then I spotted this recipe for farro using bacon on Bon Appetit. 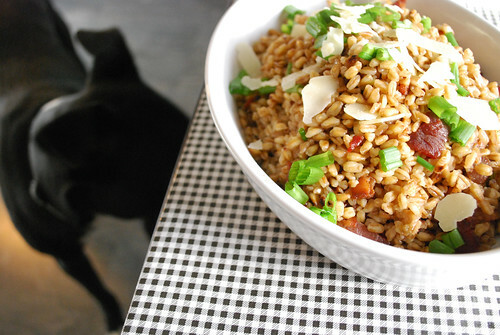 I’ve been meaning to play around with farro and this recipe hit all the right notes featuring cheese, the tang of lemon juice and lots of bacon pieces. It cooks a lot of like risotto but the only difference between my recipe and Bon Appetit’s is the cooking time is reduced in half. Go ahead and spend up to an hour in the kitchen if you want to make this, but if you want to spare a little time, look for a package of 10-Minute Farro at Trader Joe’s. Bring broth and 1 cup water to a boil in a medium saucepan. 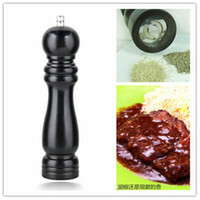 Reduce heat to low and keep warm. Heat large saucepan over medium heat. Add bacon and cook until crisp. Move bacon to paper towel to drain fat. Pour off all but 1 tablespoon fat from pan. Add scallion whites to pan and cook, stirring often, until soft, about 2 minutes. 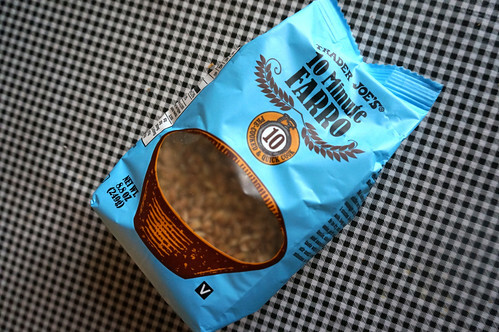 Add farro and cook until lightly toasted for about 3 minutes. Add wine and stirring, until liquid is almost completely evaporated. 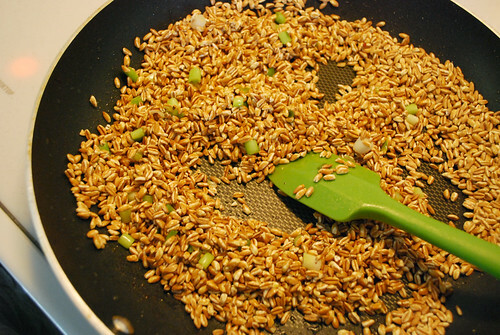 Add 1 cup warm broth mixture to farro and cook, stirring often, until broth is absorbed, about 4 minutes. Continue adding broth mixture by cupfuls, stirring often and letting broth mixture absorb before adding more, until farro is tender but still firm to the bite. Stir in lemon juice, half of scallion greens and ½ cup grated Parmesan; season with salt and pepper. Serve topped with bacon, more cheese and remaining scallion greens. I like the new design! Nice and clean! We’re trying to get healthier this year – we spent way too many months eating and drinking whatever we felt like, combined with too much couch time (I blame the cats for weighing us down). This looks like a super easy dish to put together and eat during the week. Plus, bacon and scallions! How can it go wrong? Don’t let the title fool you. We had so much bad stuff in the house too. I missed being in an office where people brought in bad stuff to nosh on all day. So I overcompensated by buying all the holiday cookies I can from Trader Joe’s and sharing it between me and Paul and the occasional guest who stopped by. Unfortunately, it wasn’t documented (hint: don’t buy the selection in the plastic bucket – YUCK). Hahaha… I bought that plastic bucket of cookies! I was suckered by the thought of a whole bucket of butter cookies. I ate one and sent the bucket to work with Travis. I managed to not buy a single box of jo-joes and only bought the salted caramel chocolate shortbread things when I knew we were headed to a party later. I love the new look. Plus anything with bacon is just fab!! Thanks Stephanie! If you try the recipe, let me know what you think.